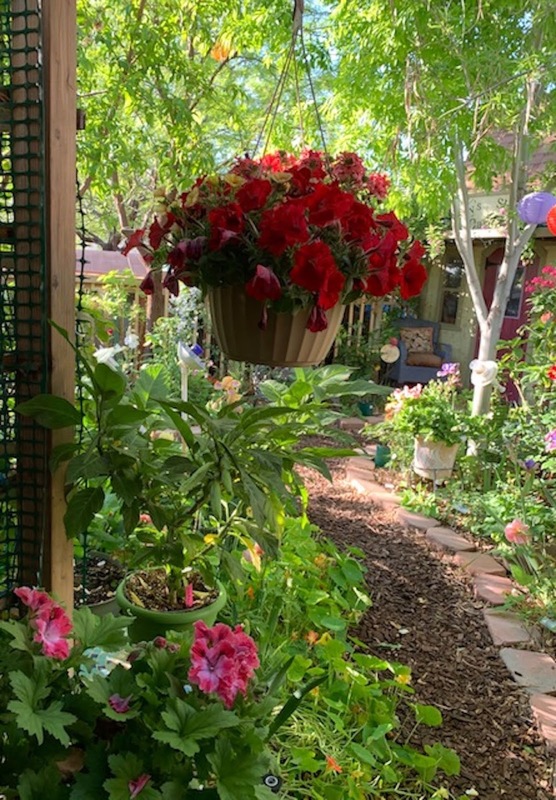 Cottage Gardening in the Desert. 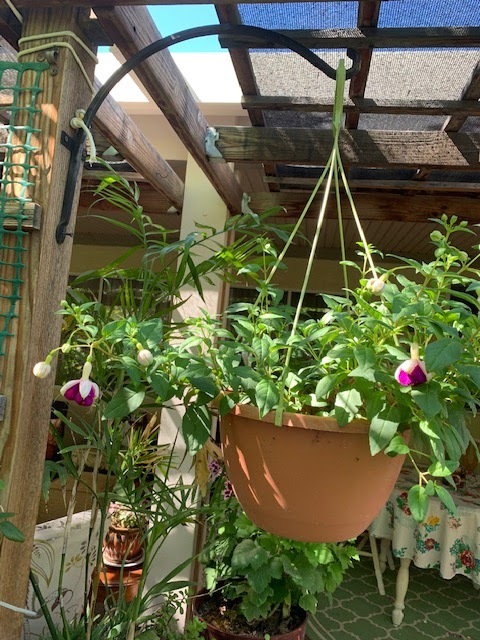 Hanging Baskets are a must for small gardens such as mine. 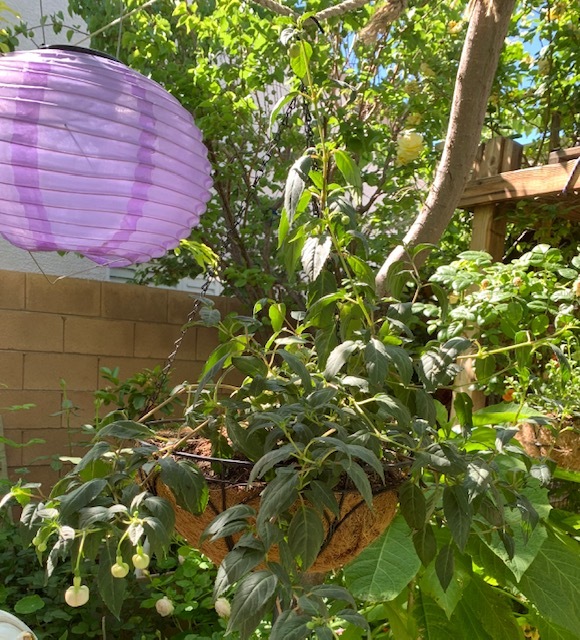 It adds quick visual interest and color to the garden. I start all my baskets in the fall-winter in my Garden Shed/mini greenhouse. 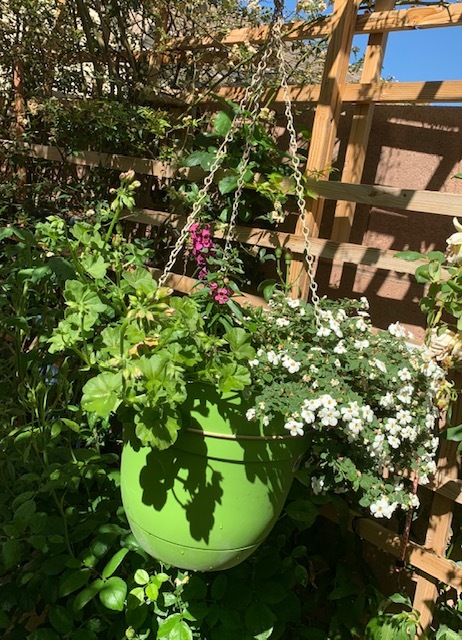 I nurture them along until Spring which is about March 1 barring any late cold fronts for Las Vegas. 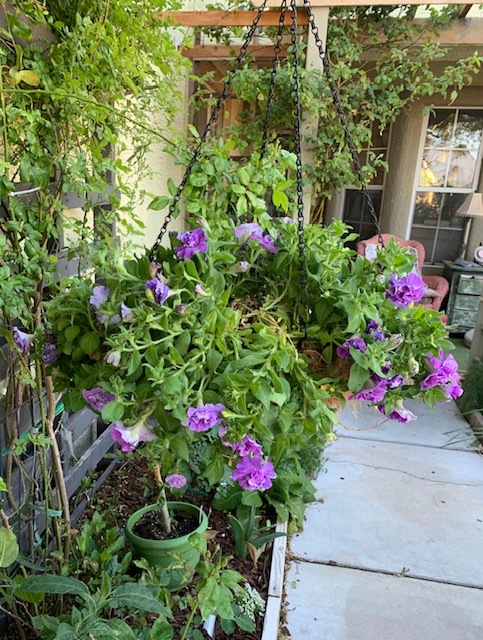 They are big and bushy by the time I set them out and flourish in the cooler climate before the unmerciful sun reaches 120 degrees! 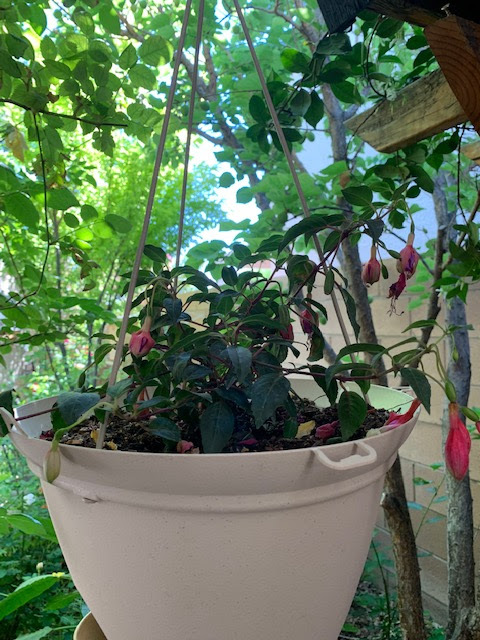 I usually start with small fushia I order from www.fushia.com and they are sent about 3 inches tall and also order my exotic geraniums from www.geraniaceae.com and they are sent somewhat larger but still small enough to grow over winter. 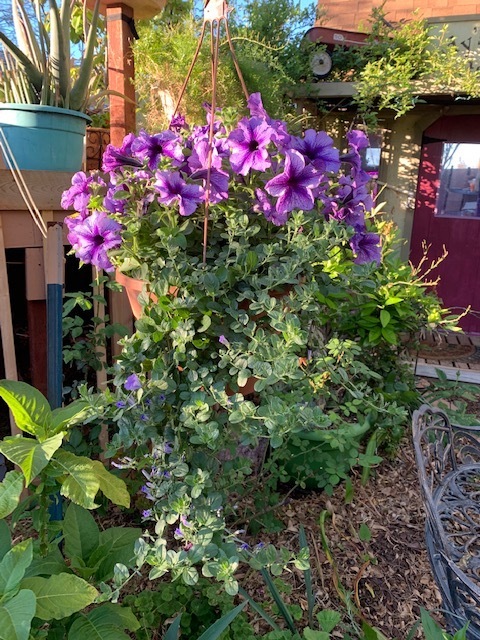 Petunias and such can be purchased at local nurseries. 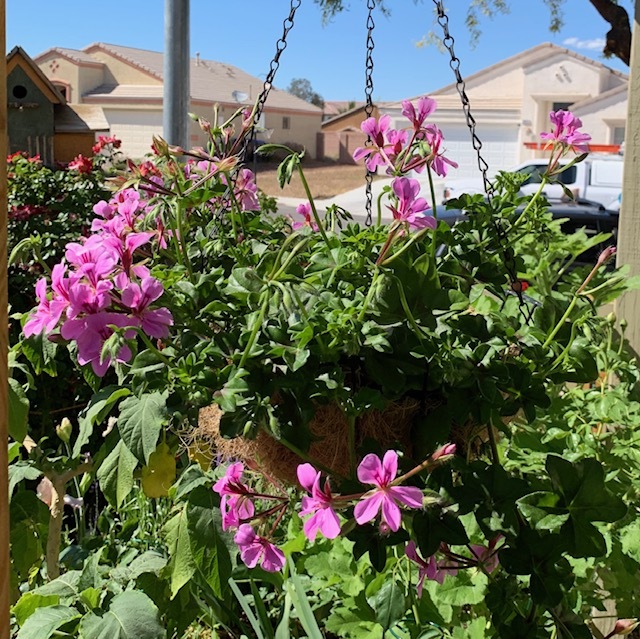 I add granular feed such as osmocote when I put the basket together and water daily with a weak mixture of water with a bloom booster. 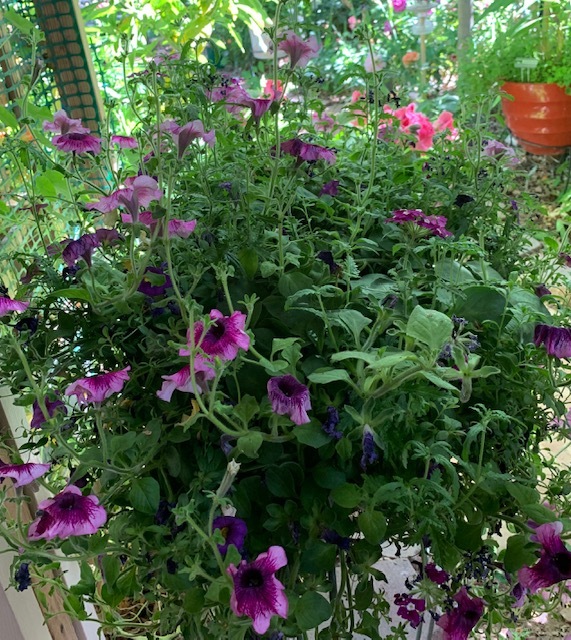 The baskets will generally last until the end of June and by July 4th they are struggling with the heat. 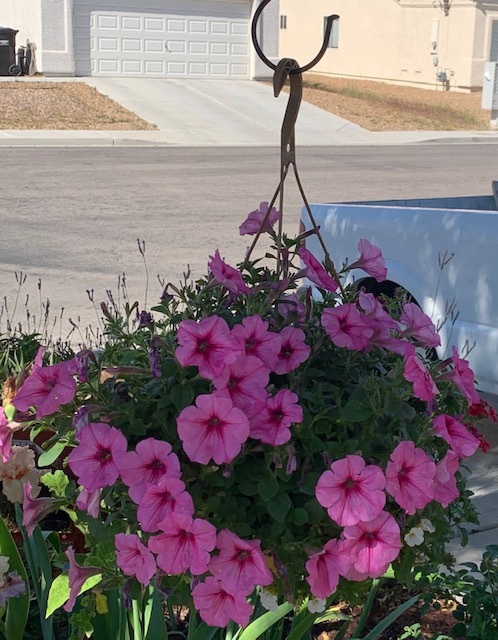 When I lived in Ohio there were so many varieties of double petunias to choose from it made your head swim, but not so in Las Vegas. 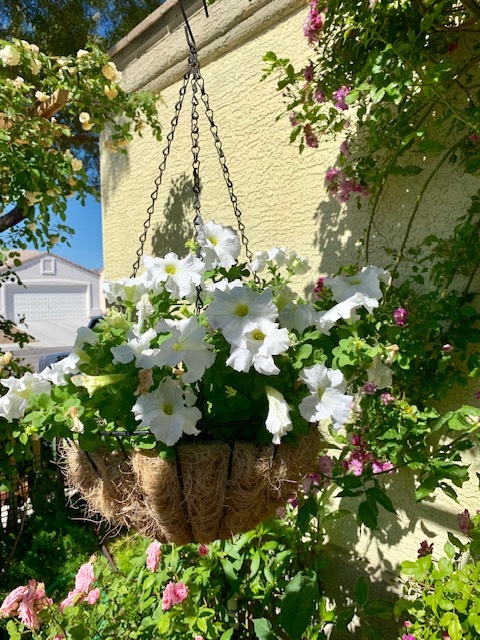 The only ones sold are single, the above basket is made with the rare double petunia I found one day at Star Nursery and never to be found again! 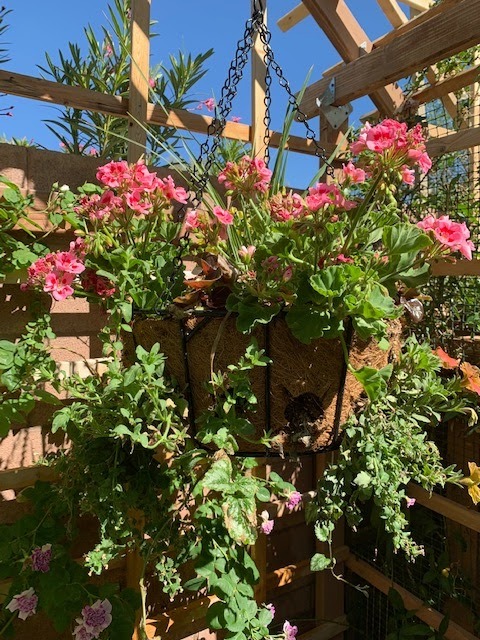 A basket mixture of re Petunias, red verbena and yellow-red mission bells. 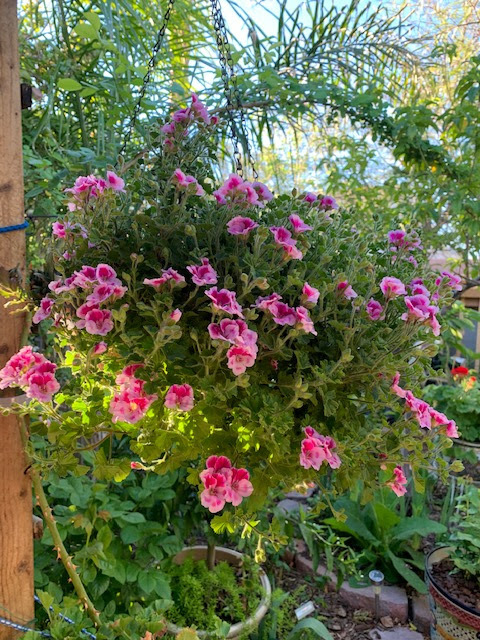 I started this basket from a cutting of another geranium I have owned for a long time. 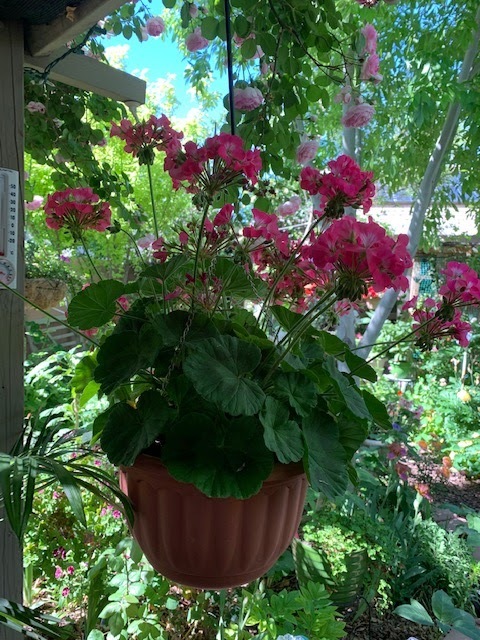 One of my favorite pastimes is starting new plants and geraniums are by far the easiest to start. Waiting for the explosion to begin. Just opening their beautiful little heads! 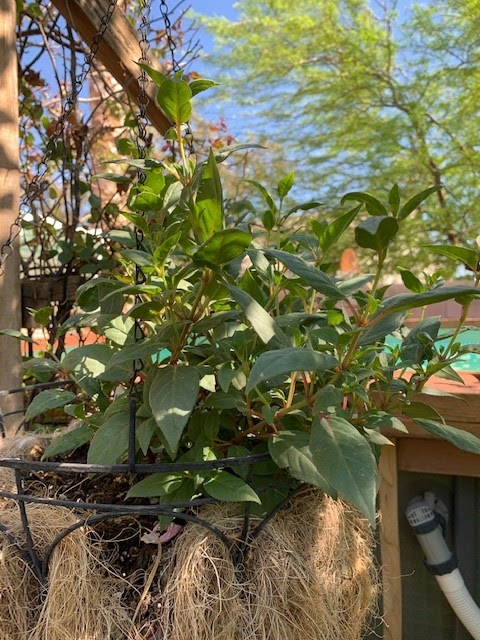 This huge basket I bought at Kingsgate.com and it has 15 different plants in it. I can't wait for the basket to totally fill-in! 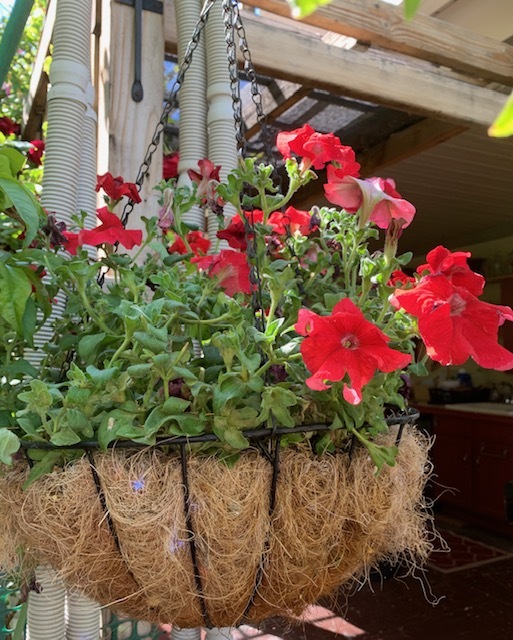 A simple basket of red petunias. 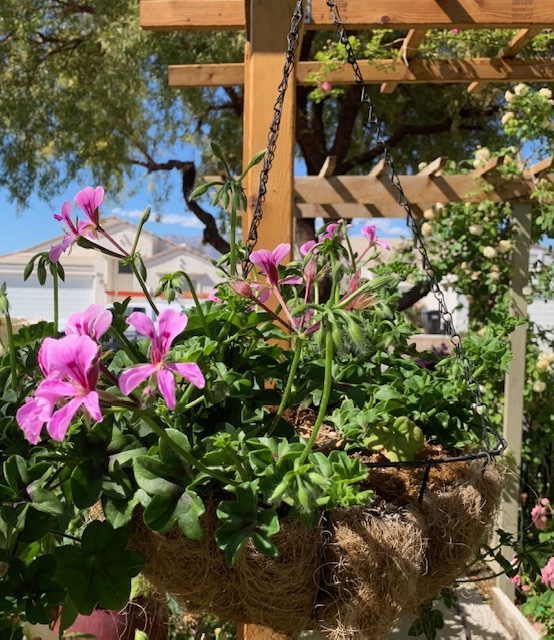 A mixture of bacopa, Guara and hanging geranium. A white basket is a must to give balance and dimension to the other more colorful baskets. The hot pink petunia, this welcomes visitors into the garden gate! Nothing can be more beautiful than trees blooming in the Spring. 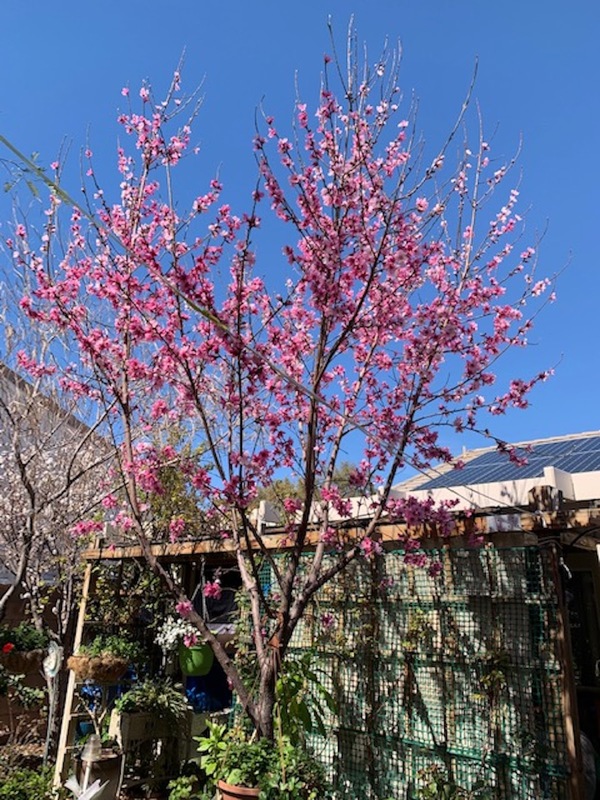 I especially love fruit trees blossoms they are so generous.